Hyundai debuted the Venue at the New York Auto Show today, saying it makes for the seventh SUV in the automaker’s lineup. That’s a good and necessary thing for Hyundai, which has suffered in sales recently for having too many sedans in an SUV world. 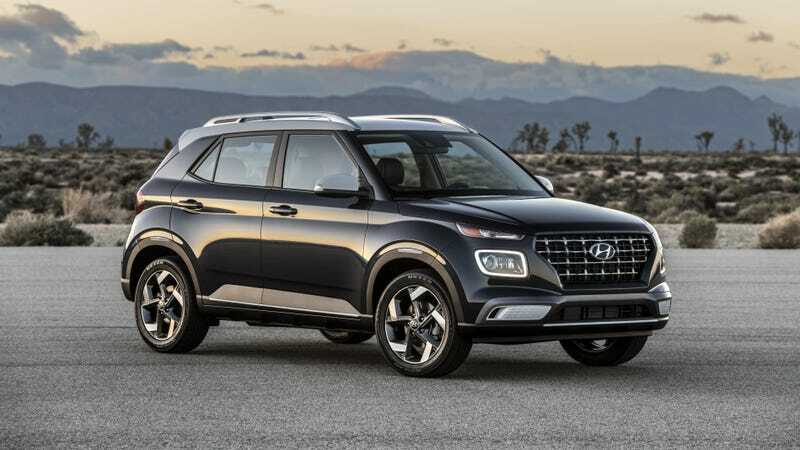 It’s also the smallest one Hyundai offers, and will come with equally small amounts of power—Hyundai didn’t mention horsepower or torque in its announcement of the Venue, but a drive story from Motor1 said the SUV’s 1.6-liter, four-cylinder engine will send 121 horsepower to the front wheels. The announcement did, however, say that the Venue is expected to get 33 mpg combined, and that it’ll be mated to either a six-speed manual or Hyundai and Kia’s “Intelligent” continuously variable transmission. In addition to the mechanical stuff, the SUV will get an eight-inch infotainment screen that can house Apple CarPlay, Android Auto and navigation, heated front seats, a snow-driving mode to help its FWD delivery, and safety tech like lane-keep assist, forward collision-avoidance assist, and other collision warnings—all of which won’t be cheap to repair, even if the SUV seems like a budget buy. Hyundai didn’t specify price aside from calling the Venue “affordable,” but said it’s expected in dealerships in the fourth quarter of the year. But affordability and “save the manuals, even in practical SUVs” cheers aside, there’s just something so off about the looks of this thing. Is it the fact that it’s so short and wide, looking almost as if it’s melting onto its own wheels? Or is it the overcrowded feel its front end gives off, radiating vicarious stress onto anyone who gazes upon it like a desk covered in unorganized papers? Maybe it’s all of the above, but the Venue certainly isn’t the only crossover to look a little imbalanced on the proportions scale. The inside is fine, at least. Hyundai’s repeatedly said the Venue is named as such because the idea is for it to be “a ‘place’ people want to be seen in” and to “embod[y] the characteristics of ‘the place to be,’” and its success in doing so is, well, subjective. But beauty is subjective as well, and someone at Hyundai apparently thought this SUV was a real beaut. Perhaps they won’t be the only one to think so. At least it has a stick?